A bit inspired by a tweet from Noel Jenkins and by some Year 3/4 work I saw at my son's primary school, I dug out some old drag and drop html techniques and came up with an interactive weather map. 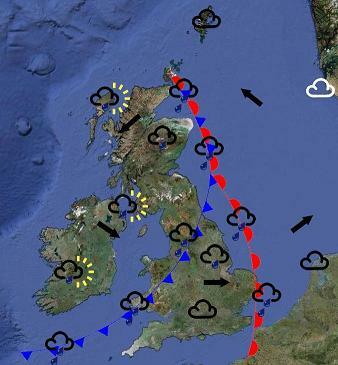 You can use the standard 70s/80s BBC weather symbols to produce your own weather map. The symbols will move around however you want them to and you should have plenty of symbols to play with. There are some technical notes at the foot of the page you might want to read. There are three choices of map. Which one you opt for will depend more on your screen resolution than anything. You might want to read the technical notes as well. It's worth noting that these won't work at all on iPads. > Mexican Map - especially for Mrs Allen's class, a map of Mexico with weather symbols! Maps with Fronts - these have three cold and two warm fronts and an occlusion as well. And now wind arrows! The fronts might be a little tricky to drag around - the images are actually square boxes and you may find that once you have the fronts in place that it gets a little trickier to move other symbols. You may find that you need to scroll vertically - on a narrow monitor the symbols may well get pushed below the map. You might want to go to Full Screen mode (F11 usually does this - then use F11 or Esc to get out of it). You have 16 of each symbol available (apart from the smiley sun - there's only four of those). If that becomes a problem then please let me know as it would be a quick and simple job to change the number. Please report any issues when using the pages - I could use feedback, either positive or negative, about this stuff. Feel free to use these for non-profit use in any way you want. A link back here would be nice. The weather symbol images originally came from Mel's Brushes and are used under the terms they were downloaded under - for non-profit use. I've modified them (and added some) and reduced them dramatically in size in order to reduce loading times. This page created: 9 October 2010. Last updated: 15 June 2018.